Today we present you with a wonderful collection of 18 free PSD business card templates that are designed in stylish abstract forms and shapes. This beautiful and useful collection will come in handy for many professionals out there who want to be represented in the best possible way. Take the time to customize these wonderful templates in Photoshop. This way you will make them personalized and unique and you’ll raise your chances to impress your recipients. A fully editable free PSD business card template that comes in a super modern abstract polygonal design. The PSD file contains all elements as separate layers, named and grouped, which makes it very easy to customize. A stylishly designed business card template with wavy abstract lines. This PSD design comes in blue but feel free to modify it according to your personal needs. This business card template combines an elegant design and functionality. Packed conveniently in a fully-layered and organized PSD file, this template allows to be modified according to your taste. An attractive abstract design of a business card which can instantly catch the eye of the recipient. This beautiful design comes in a conveniently layered and grouped PSD file which makes it very easy to be customized. A stylish blue business card suitable for many kinds of businesses. This template comes in a fully editable PSD file which is conveniently layered and grouped, so you can edit it as you like. A free business card template, elegantly designed with wavy lines and presented in luxury colors: black, white and purple. Feel free to modify this elegant design according to your specific desires. Two styles of abstract business card templates, both suitable for many kinds of businesses. These elegant designs are very easily editable and can be personalized with just a few adjustments here and there. A very cheerful design of a free PSD business card template that comes in a conveniently layered and grouped Photoshop file. Easy to work with, this template allows to make changes and personalize its look. 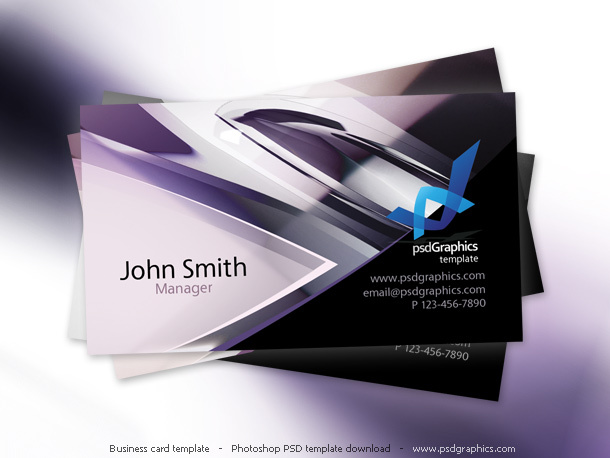 A simple and modern design of a business card that comes in a PSD file. This template is very easy to customize, so feel free to personalize it by modifying the colors and the other elements. A very eye-pleasing design of a business card which will surely grab the attention of your recipients. Looking like geometric liquid, this PSD template’s details are very easy to customize. A cheerful business card design presented in bright yellow, orange and red colors, representing sun beams. This PSD template is very easy to edit, so go ahead and personalize it according to your needs. A nicely designed business card that looks like it’s way ahead of its time. Being absolutely free to download, get this PSD template and replace the texts with your own info. A beautifully designed abstract business card that can be used to represent beauty salon businesses or other. This template comes in PSD and can be edited to fit your personal needs. A vintage looking design of a business card that comes in stylish brown and black colors. Suitable for plenty of businesses, this design will make you look like a real professional. It comes for free, so go ahead and get it. A business card template that can easily be used in plenty of business fields. It’s multifunctional, stylish, clean, and comes in easy to work with PSD file. Get it absolutely for free. A very stylish and modern design of a business card that comes in customizable PSD file. This template is perfect for many kinds of businesses and professionals, and it also comes for free. A business card that comes in eye-pleasing green colors and abstract clean design. Suitable for any nature related professions and business fields, this template will present you in the best light. A modern, beautifully designed business card with clouds and presented in nice eye-pleasing blue colors. This template comes in free to download PSD template which is also print-ready. We hope we have been helpful with this collection of 18 free business card templates. Remember, that all of them are free to download and customize just the way you need them. We are preparing more freebies for you, so see you soon!